Today is the last day of September 2013 and so far I haven't yet written a journal post for months (literally). It's officially been months since I actually sat down and wrote a post featuring my life. I felt as if writing a long journal post about my day might be boring, so to change this up I decided to create a new series each month featuring some photos dedicating to the month. These post will included my favourite moments of the months, some random photos, inspirations thoughts/comments, readers/tweethearts thoughts and more random things. Also, I forgot to mention that I came up with this idea after I received a few "anonymous" comments requesting me to do more personal life journal types of blog posts. Thank you so much for those suggestions and I really appreciate them all! Since this is the first post for this series, I really hope you all like it and if you have any suggestions/ideas please feel free to let me know. I am always opened for suggestions and also for criticism. Spent the first two days of September by going shopping to purchase some back to school items. drinking Ice Caps from Tim Hortons. 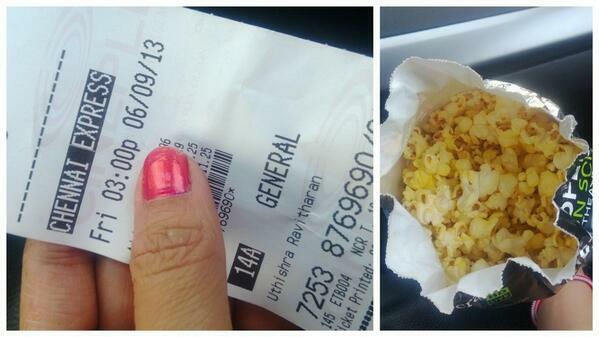 On September 6th I finally spent the evening to watch Chennai Express with my sister and grandma. Definitely one of the best movies of the year!! I miss taking strolls in the park. 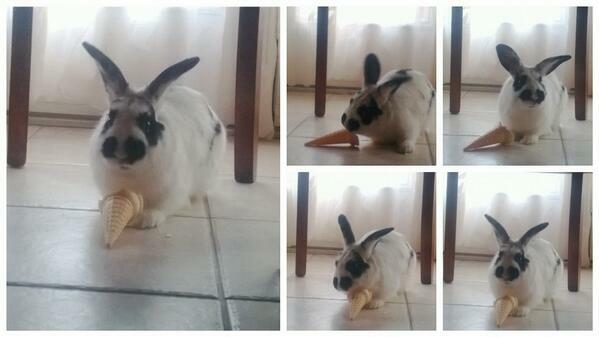 My rabbit, Oreo enjoys eating an ice cream cone. 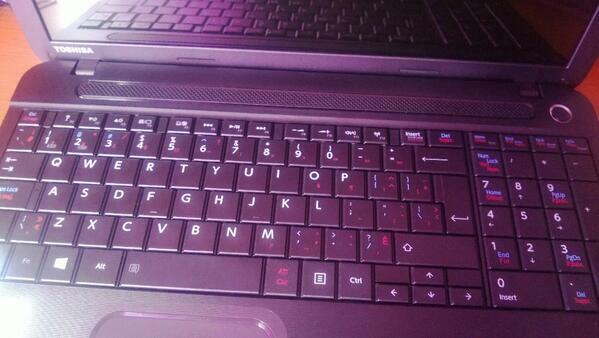 My parents got me a new Toshiba laptop. 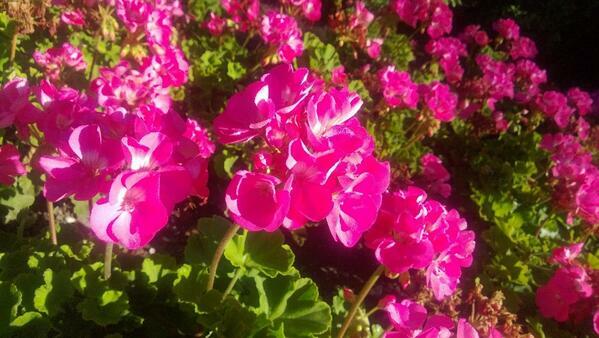 Random photo of flowers at my campus. 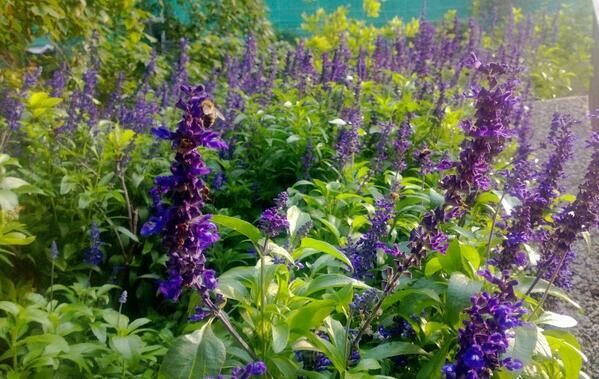 Another random photo of flowers from my campus, I like taking photos of nature. Also, one of the biggest thing that happened during the month was, school started!! Well, I hope you like this new series and the next post for this series will be out on Oct 31. 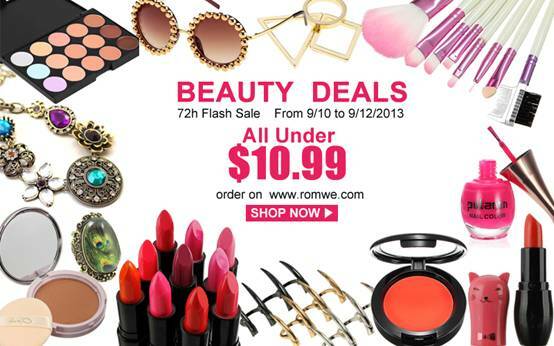 Also, Romwe is having another awesome sale for October!! Unfold your free style with Romwe items. Do not miss! 72h only! 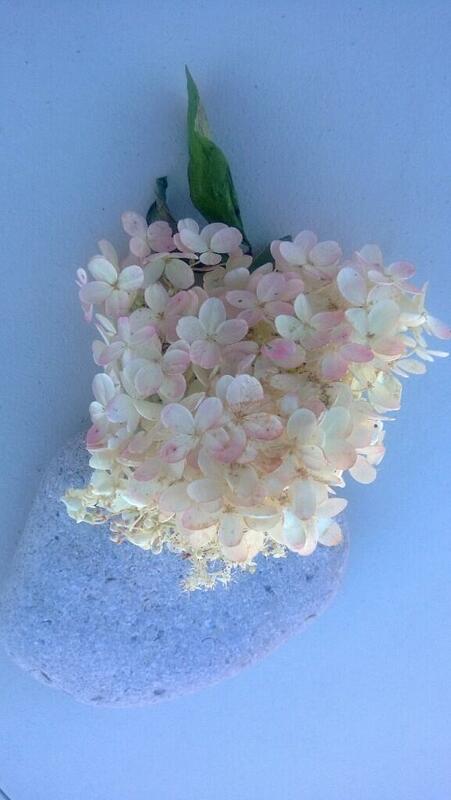 Take care and have a lovely week! It's been over a week since I posted an outfit post and recently have having been trying to get my class schedule in order. Some of my classes were all over the place and I need to review all the requirements and such, however now everything is finally back on track. I have chosen my courses and even started working on my finally projects. Anyways, other than that the weather has been extremely gloomy so I wasn't able to do an outfit post but lucky yesterday the weather was extremely warm and sunny, so I took advantage of the beautiful weather to do an outfit post featuring my recent obsession. My recent obsession has been prints, I have been wearing printed tops and printed pants, however this particular piece of item of Aupie has definitely won my vote as the best pair of printed piece ever. I have been looking for the perfect piece of tropical inspire item so when I received this particular pair of harem pant from Aupie, I was over the top. I just immediately feel in love with it, but sadly I had to wait for a few days until the weather got warmer to rock this outfit combination. So, what do you guys think about printed clothing pieces and what do you thing about this look? Well, I hope you all have an amazing weekend and also, I have hosting a international giveaway from CiChicso definitely check it out (who knows you might be the next winner). Talia earned her wings on July 16th after six and half year battle with childhood cancer. August 18th would have been Talia's 14th birthday. Talia contacted Romwe to join their fashion Vloggers Team last April. Through this, Talia and Romwe's design team designed several leggings together. Talia have always said that “make up is my wig”. Hence, they came up with makeup-inspired images to be printed on the leggings. However, Talia was not able to enjoy these leggings as she was too sick when the leggings were already manufactured. To commemorate Talia's great memories, Romwe will donate $5 to Talia's favorite charity, the BASE Camp Children's Foundation, for every pair of leggings sold. Here are some of the designs that they came up with: Lip-print Black-white Leggings, Colorful Lip-print White Leggings, Lipstick Print White Leggings. This event will start from September 27 until October 11 of this year. Please support this project by Romwe! and slowly moving on to more chunky ones. First of all, Cichic.com has a ton of items that every woman can choose from. Cichic.com is an online fashion clothes retailer based in China, offering a complete line of the latest fashion clothes for all fashionistas. They offer fashionable, affordable, and chic tops, dresses, bottoms, and accessories. They ship worldwide so anyone from around the world can buy their products! With the $100 here are my top four picks!! As a thank you to all my lovely readers, I have teamed up with Cichic.com to conduct a giveaway for the new season. 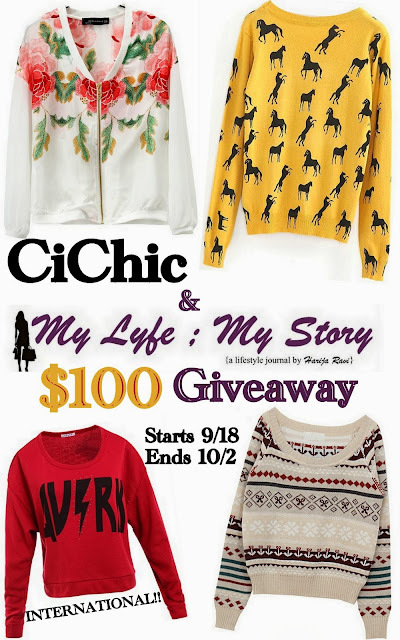 So, for this fall season, one of my lucky readers of My Lyfe ; My Story will win a $100 voucher sponsored by Cichic.com. 5) Leave a comment on one of my past posts. Good Luck to all of you and remember this is an international giveaway!! 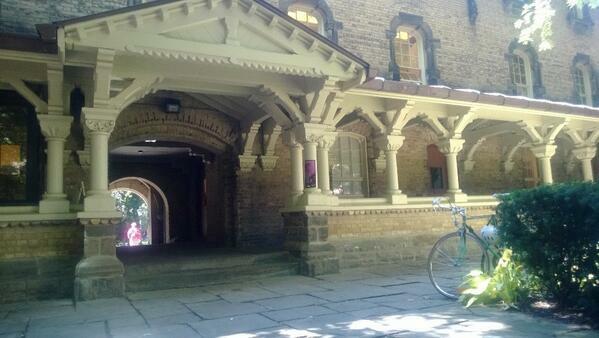 Today was my last day of my first week of class for the fall 2013 semester. So far, I am pretty pleased with all my professor and courses, plus most importantly I love the fact that I am done all my classes by 2 pm except for Wednesday, I finish at 9 pm. This semester all my classes are well planned out and my only complaint would be regarding the work load. However if I need to succeed in life they are required to go through these stressful moments. Also, other than school yesterday was the Masterchef finale (I am not sure how many of you actually watch this show), but I find it to be relaxing especially since it's food. After I watched the show last night I started questioning myself regarding the show. By the show, Masterchef is cooking show based on home cook and their ability to cook meals featured in high end restaurants. I have a small problem with the pressure test theme in the show, I mean do you thing high end chef like Gordon Ramsay are put through a timing process when they are cooking in their restaurants. Well, I don't think so!! Even though I enjoy watching this show, yesterday while watching the finale it struck to me that the idea of the pressure test in this show is definitely questioning. My solution for this is that maybe next year, I would like to have one of the three head judges for each pressure test to join the competitors by cooking a mystery box/pressure test meal with them. Anyway, this post is definitely all over the place, I started off by taking about my first week of school and end up with Masterchef Season three. Anyways, in today's outfit post I am finally wearing a peplum inspired item. Over the months the peplum trend has taken over the whole fashion world however for some weird reason I haven't been fond of the look. But, I decided to take it slow by finally getting myself a pair of Lace Peplum Blazer from OASAP. I love the end look of this outfit and also, I wore all clover related jewellery pieces from Bellast. Other than that, this outfit is literally like a uniform for me, because during my stressful days I tend to stick with the black and white combination. That gives me a great idea, I think I should a do a post featuring all my black/white outfit look combinations (and trust me I have a long list of items). Anyway, that's all for now!! Take care everyone and I will be back again soon with another post. Well, it's not officially fall but it definitely feels like it in Toronto, Canada. All last week I spent my afternoon stuck at home trying to find something activity to do, since the weather has been so cold and gloomy. Even though, I am a huge fan of winter I still struck with the transition between summer and fall. Especially this year, I felt like the weather hasn't been on my side, one day it cool and the next day its super hot. So, instead of packing light, I normally end up carrying an extra hoodie and an umbrella for safety. Since fall it hear, I wanted to keep my first fall look simple with a casual sweater by pairing it up with pants. But instead of keeping the look simple I ended up mixing two different materials and patterns together. 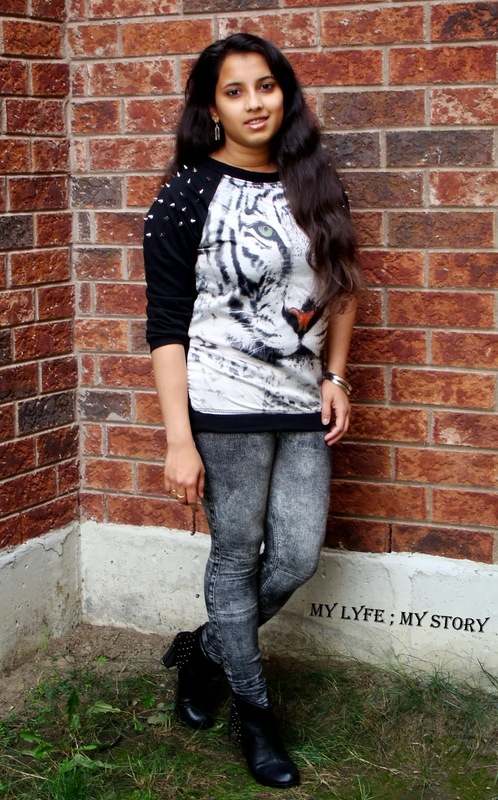 The sweater gives the look an edgy feel, because of the rivet studs and also the boots make it look casual too. Plus, the pants gives the whole outfit a chic vibes, it looks like I actually took effort to create this look. Finally, as usually I felt my hair down but this time I tried to keep it in a messy feel, since I didn't want to look overall prepped up. Furthermore, as usually I kept my make up simple by wearing black eyeliner and instead of a bright lip gloss I when for a pale lipstick. Since I will be heading back to school on Tuesday, I am try to go back to my old school makeup routine; which is literally wearing no makeup at all. Well, other than that my day has been awesome and on Friday I ended up watching the movie Chennai Express. For the last few weeks I have been wanted to watch it and sadly I was always too busy to go. But thankful my sister and my grandma decided to drag me along with them to watch it. Definitely an amazing movie with both, Tamil and Hindi language (including English sub). I really love it so much and I really want it watch it again. So, far that's the only interesting thing that occurred in the last few days and also, I will be posting another outfit post soon. As a girl, is it possible to live without makeup & cute accessories? Well, take care and have a safe Sunday. This is my last summer outfit post for the 2013, recently the weather in Toronto,Canada has been extremely cool and I literally cannot leave my house with a jacket. Especially in the early mornings, I actually started wearing my fall boots and carry a scarf around.To be frank, I love the fall season than summer, I love to layer my clothing items to keep myself warm. For instance, in the summer even when it's hot, there is literally nothing I can do. However, when the weather get colder I love to go out. This reminders me, this summer I didn't even get the opportunity to go to the beach since I was too busy with school. Well, I think about it this summer, I have been only off for fourteen days and in those days I spend atleast half of them at home, organizing my room and catching up with my friends/family. Anyways, now it's too and I will be back in school on Tuesday of next week. This semester I tried my best to plan out my schedule to actually give me some time off. So, I have three days of school during the week and I will be off from Friday to Monday (literally a four day weekend) and this year I am hoping to get myself a part-time job or more volunteer work. Hopefully more blog posts and I am hoping to do atleast two per a week (if I am able to do more, that will be awesome). 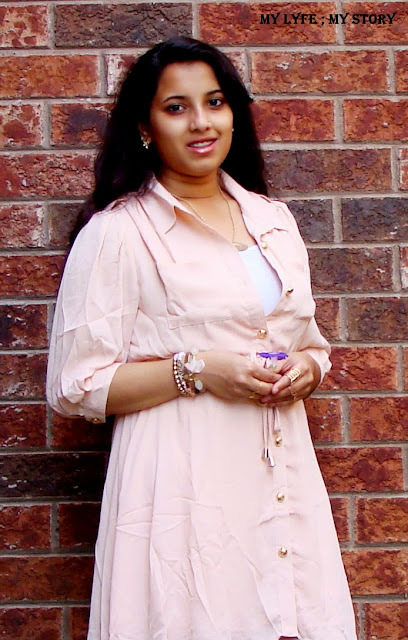 Also, I wore the Pink Shirt Dress to the mall last week and it is so comfortable. I kept the look simple and the only problem I have with the dress is that it tend to get wrinkly fast. Other than that, I think the dress is a must have for all women! Well, how was you guys enjoy your summer and what was you highlight this year? Anyways, take care everyone and I will be back again soon with another post.